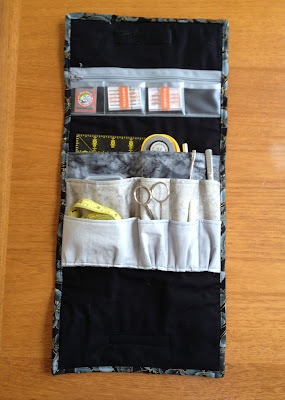 At a recent RAFA (Rochester Area Fiber Artists) meeting, one of our members, Margaret Reek, shared instructions for creating a handy case for toting around sewing essentials. I have always wished I had such a case, but, of course, I only think about it as I am packing up for a sewing class somewhere. Using Margaret's instructions, I took the time a few weeks ago to finally create my own case. I kept my design fairly simple and was able to use up some of my stash. 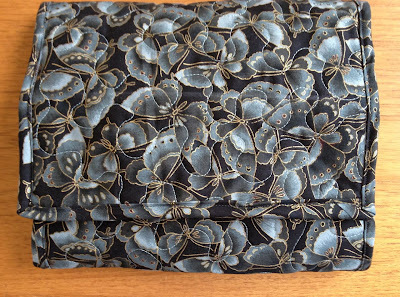 Margaret chose to make hers much more colorful and varied the fabric for the various pockets. You can see the attention to detail that Margaret put into planning the case. The upper row is a zipper compartment made with vinyl. It is subdivided to fit four conventional needle cases and the vinyl allows for easy viewing. The pockets in the middle can be varied in size for items that you usually carry along to a class. I just followed Margaret's directions and found her choices totally functional. The bottom third is supposed to have a pocket for a business card - I didn't do that piece. Eventually, I could fuse in my name and website.